When to Start your Kids Skiing? First, your child should want to be outside with everything on. Stuffing them into their ski suit isn’t the answer and negative experiences early on could turn the child off from the sport. Second, your child should be physically and mentally ready to try skiing, we recommends using small plastic skis in the house then out in the yard to familiarize the child with the sport and the equipment – on their own terms. If your child hates wearing mittens or has zero interest in the cute little skis, that is your barometer they may not be ready. 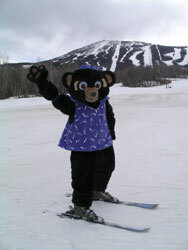 Third, take your child to a ski area just so they can watch people ski and experience some of the skiing lifestyle, hot cocoa and fireworks and skiing mascots like Sugarloaf’s Amos the Moose, to entice them. If you are just eager to go ski yourself, look for ski area daycares so you can grab a few runs with a half day ticket and pay for hourly daycare on the mountain. If you really want to get your child out at 2 or 3 on your own, it should be for a photo opportunity, and actual ski time should be short, sweet and safe – meaning you are right next to your child at all times. End your snow day well before meltdown. For equipment, check out rentals or used equipment at a ski shop (or a ski swap), but don’t shell out big bucks for all new gear for two runs this season, that won’t fit next. As someone who has “been there” both as a ski instructor and a parent of two, my advice is to get professional help – kids ski and ride camps are awesome. Trust the experts to introduce your child to skiing and riding properly, covering the basics so your child learns safely, with other children, without parental pressure, tension or tears. Most ski area lessons start children at ages 3 – 6 when they are strong enough, independent (potty trained) and ready to learn new things with parent separation. 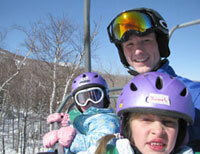 Snowboarding lessons for kids typically begin at age 5 or older. The ski or snowboard camp atmosphere is so effective – the combination of “cool” instructors leading silly but skill-developing games, and the camaraderie of other small fries as peers are powerful motivators. These lessons can be pricey at $50-$150/day, but it’s an investment in expert teaching, safety (priceless), and socialization for your child – that can be amortized over a lifetime of skiing. 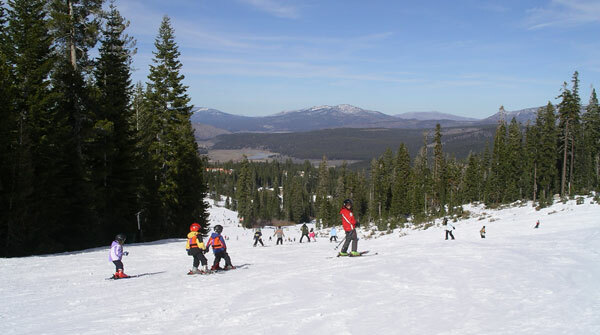 See our ski camp checklist to prepare for your child’s first day on skis or snowboarding. If you are in no rush to start your toddler skiing, waiting until age 5 or 6 certainly won’t lengthen the learning curve, it may even provide a more memorable ski experience for all. As a parent you should gauge your child’s readiness (not to be confused with your eagerness). Just like a snowman needs a good strong base or it will tumble apart, you should provide your child with a positive introduction and a fun pace so they will learn to love snow sports like you do, and discover that you’re a “cool” parent in winter. See our reviews of some of the best family ski resorts in New England and The Rockies with excellent children’s ski lessons and learn to ski and snowboard camps.